A note about this recipe: It’s a really great, easy shortcut way to make “fried” chicken, but the coating can be a bit delicate. Handle your chicken carefully when you’re turning it and removing it from the pan to minimize the loss of any crisp crust! In a large bowl, whisk together the yogurt, milk, 1 tsp. of salt, and 1/2 tsp. of black pepper. Add the chicken drumsticks, toss to coat thoroughly, and refrigerate for a minimum of 3 hours and up to 24 hours. When you’re ready to make the chicken, preheat the oven to 400 degrees. Liberally coat the bottom of one or two rimmed baking sheets (this depends on how big your chicken drumsticks are — I can usually fit 10-12 on one sheet) with the olive or coconut oil. Set aside. In a shallow dish, combine the breadcrumbs, paprika, garlic powder, salt, and pepper. Take a drumstick out of the yogurt mixture and gently shake the excess off, leaving the drumstick still well-coated in yogurt. 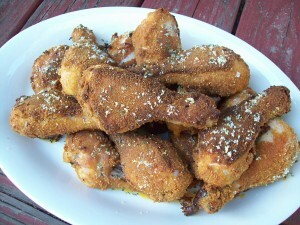 Roll in the breadcrumb mixture until the chicken is thoroughly coated in crumbs. Set on a prepared baking sheet. Repeat with the remaining chicken, leaving at least 1/2 inch of space between drumsticks. Once all the chicken is on the baking sheet(s), drizzle the tops with more oil. Bake at 400 degrees for 20 minutes, then carefully flip the drumsticks over and bake for an additional 20 minutes, until the chicken is cooked through and the coating is golden brown and crisp. NOTE: I find that the loss of breading is minimized if you place the chicken in the bottom third of the oven. If you’re using two baking sheets, make sure to rotate them at the halfway mark so each gets a turn in the bottom position. Remove the chicken from the oven and let it rest for 10-15 minutes before serving. While the chicken rests, prepare the rosemary-lemon salt: Pile the lemon zest and rosemary on a cutting board and sprinkle with the sea salt. Chop the three ingredients together until the rosemary is very fine and the whole mixture is the texture of the salt. Sprinkle some of the rosemary lemon salt over the warm chicken drumsticks (you likely won’t use it all).